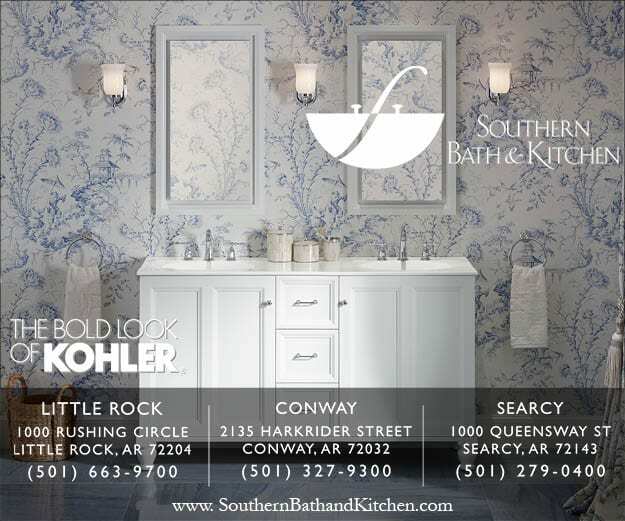 When a Little Rock couple approached Chris Milligan about building a new house inspired by the American vernacular style of architecture with lots of natural light and a “happy feel,” he knew that the open-concept kitchen and living space would be the hub of the home. 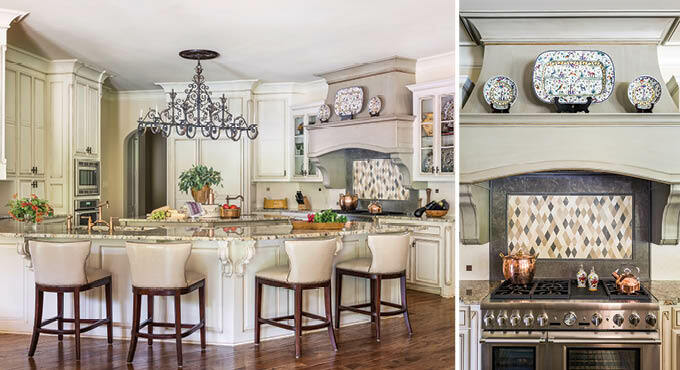 The homeowner knew she wanted her kitchen to be three things—classic, seamless, and delightful, so she and Milligan worked very closely together to achieve her vision…. 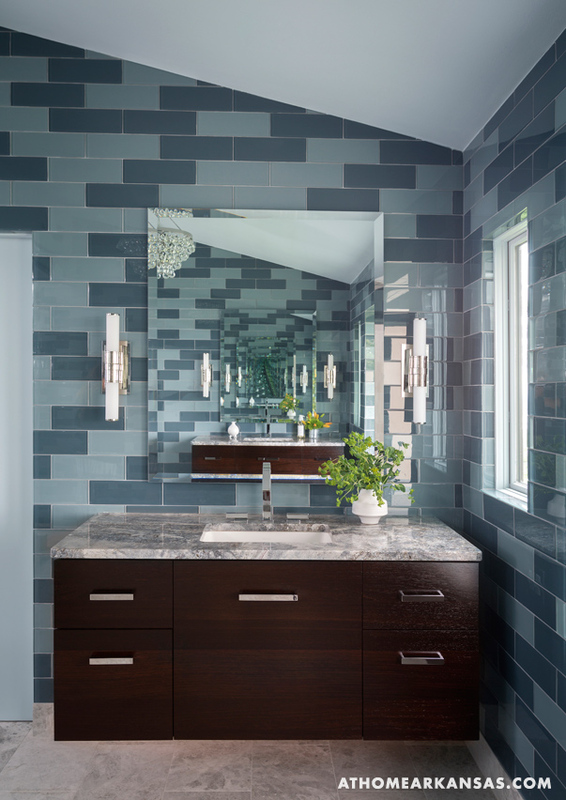 Charlene and Chuck Prousnitzer know the market when it comes to the latest and greatest in lighting, tubs, sinks, faucets, and other home design elements. 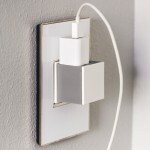 The pair have spent their lives helping clients source the perfect items and create dream spaces—Charlene as the owner of Light Innovations and Chuck as the retired owner of PC Hardware. 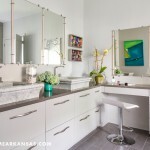 So it comes as no surprise they knew just what they wanted at the outset of a complete renovation of their new home’s master bath. 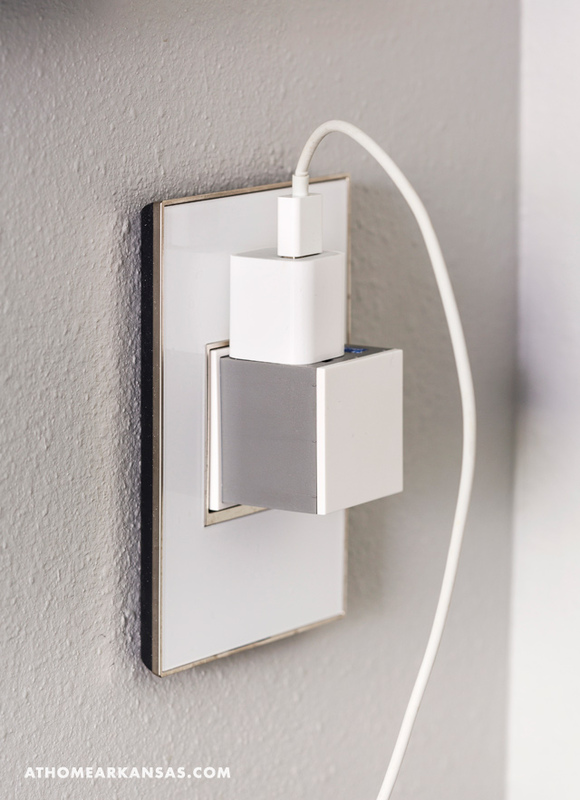 “Because we are in the lighting and hardware business, it had to show off our product,” Charlene says. 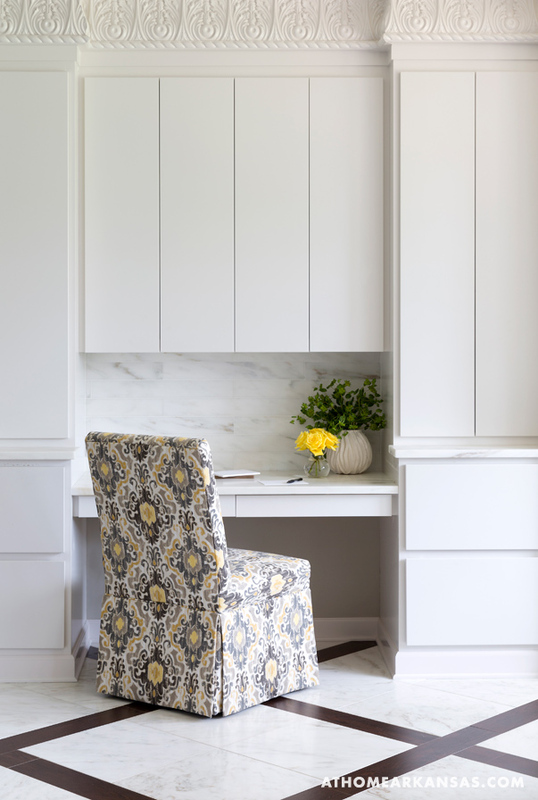 The entire project “was a labor of love between me and Jeff Junkin of Jeff Junkin Construction,” says Charlene, who holds a design degree from LSU. Contemporary in style and “loaded” when it comes to functional features, one word defines the design for both Charlene and Chuck: practicality. 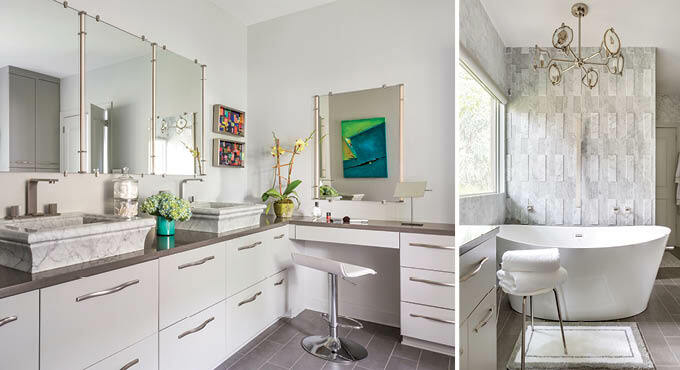 At first glance, you might not think practical when you see the striking feature wall and freestanding tub that greet you upon entry into the space. 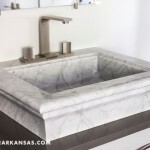 “The bath was designed around the tub faucet essentially,” Charlene says. 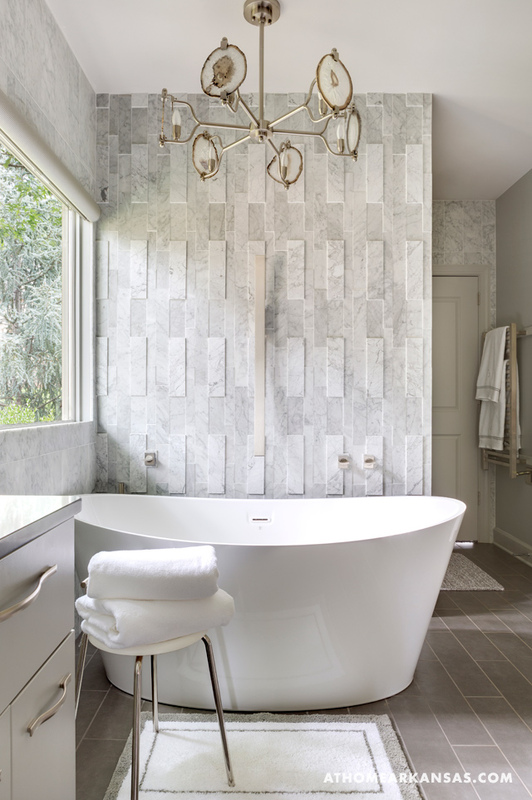 The placement was key to the floor plan in order for the waterfall to artfully fill the tub. 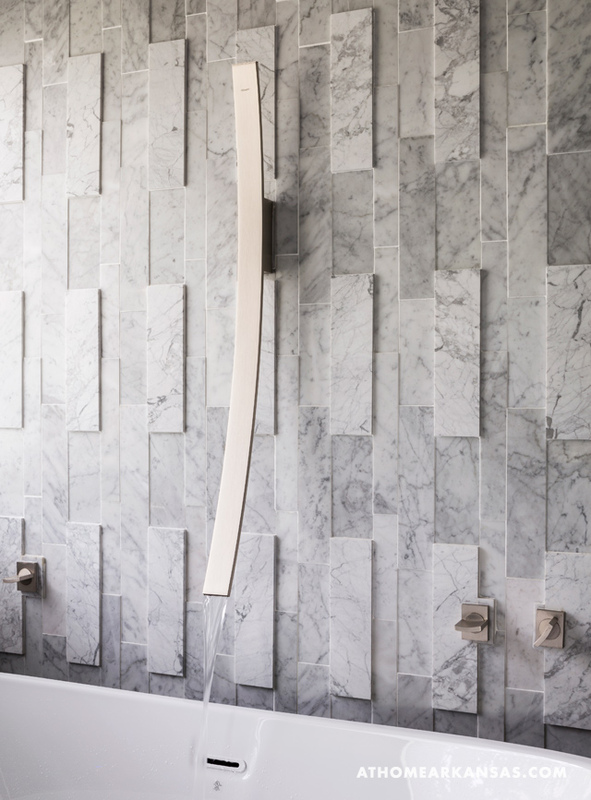 The Carrera marble, three-dimensional wall accentuates this artistry, but functionality still reigns. For example, the Prousnitzers chose a BainUltra freestanding, heated, air-jet tub. 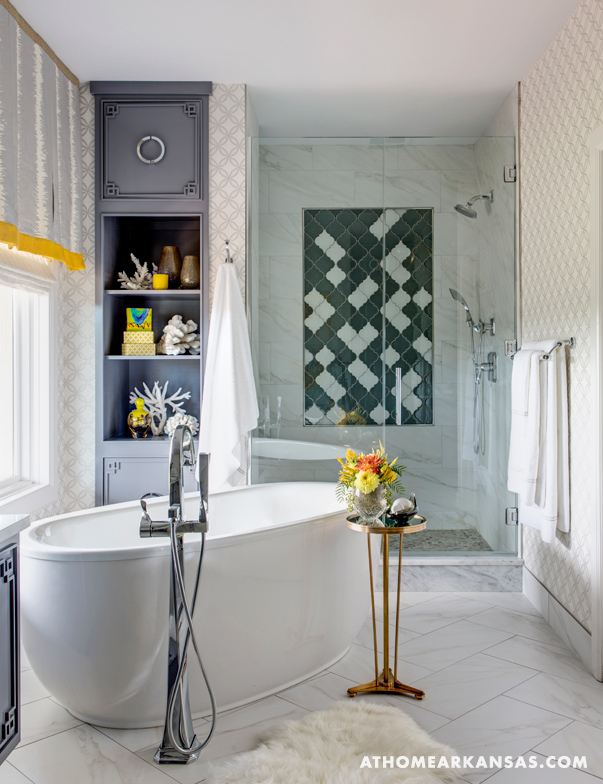 The pinhole-like jets around the edges of the bath make for a cleaner version of a traditional jetted tub by preventing buildup. Plus, after the water empties from each use, the jets come on to blow out air, drying them and preventing mildew. 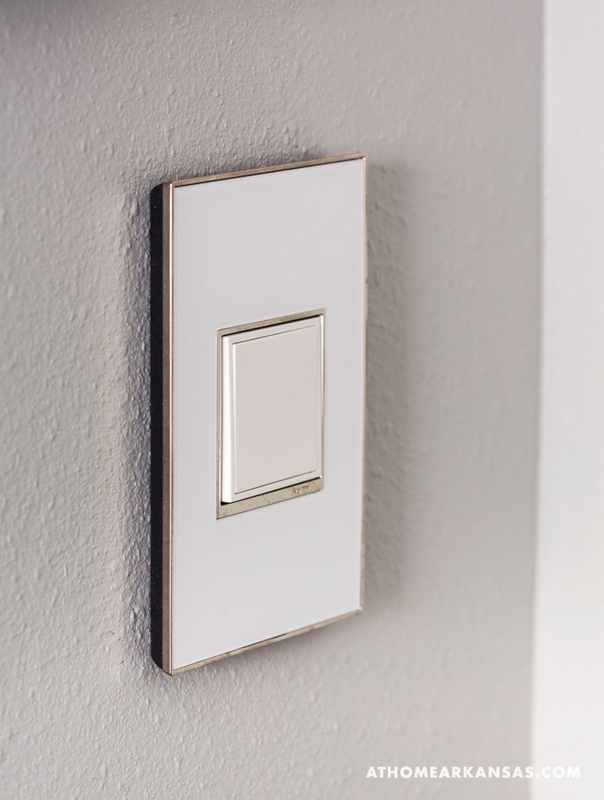 Additionally, the fixture’s satin nickel finish—which is forgiving for fingerprints—also hints at the couple’s wish for sensible design. 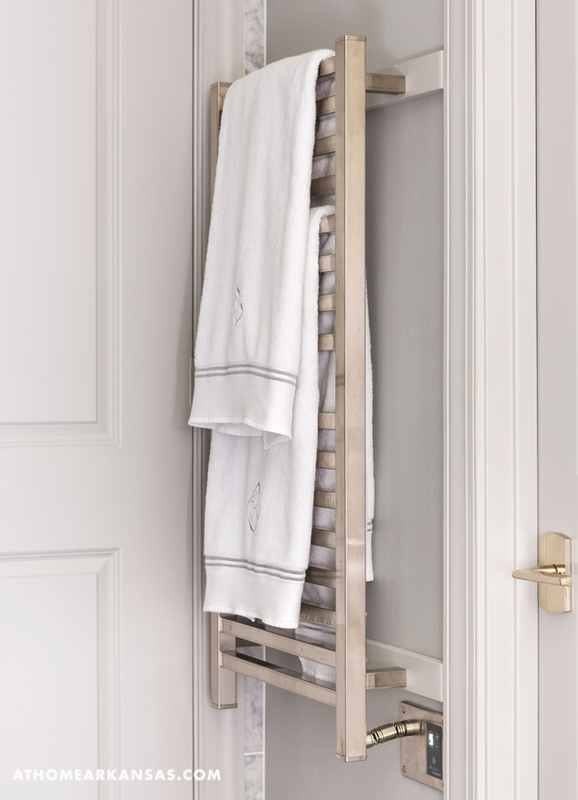 “Everything is functional but aesthetically pleasing,” Charlene says. 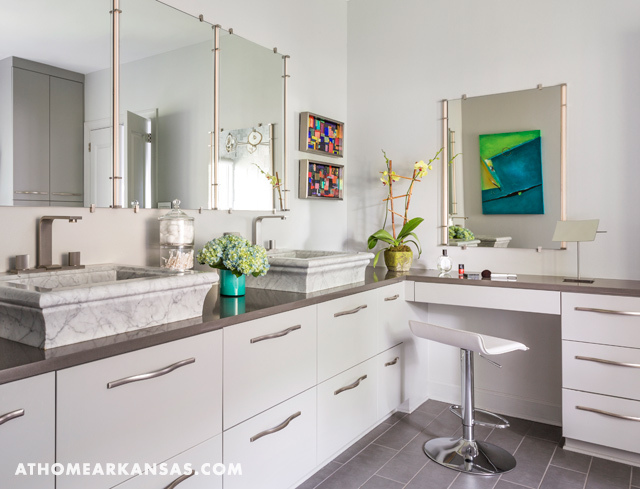 “No matter where we moved, we knew the master bath would be redone, because Chuck and I both have specifications about how we like our showers,” Charlene notes. 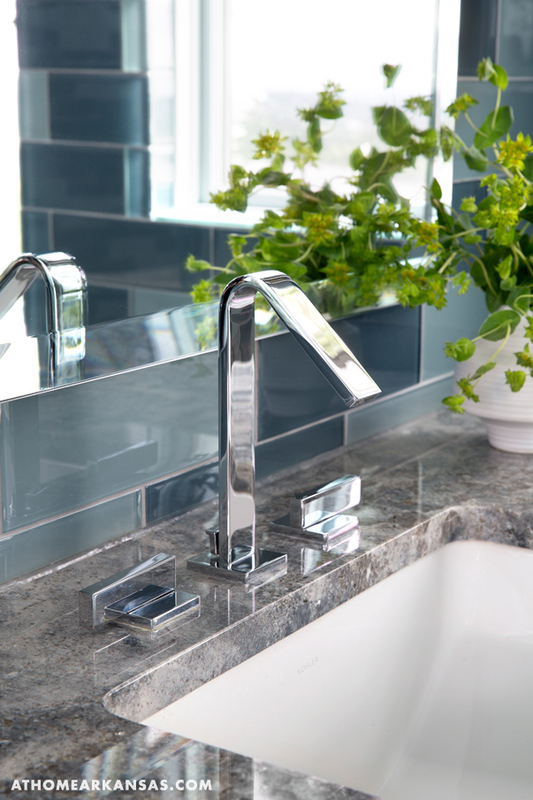 The couple had thermostatic temperature controls installed, which allow them each to switch on the water at a preferred temperature. “You can set it and forget it,” she says of the convenient feature. 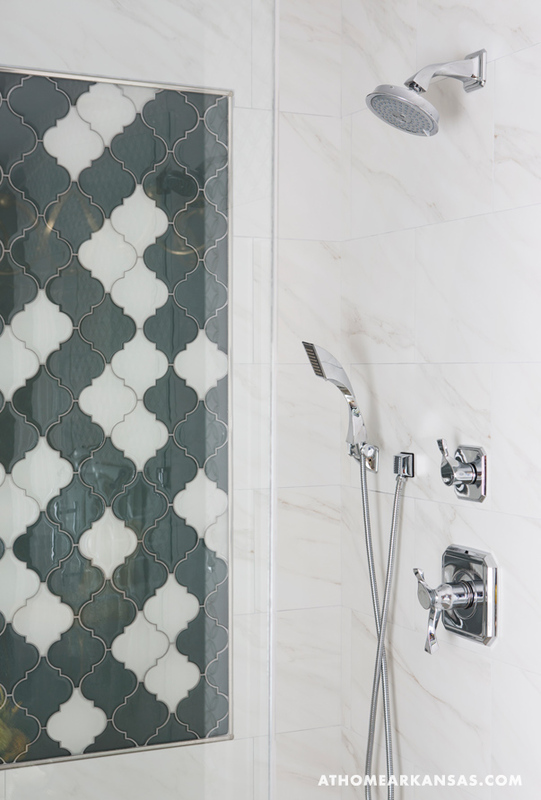 Aside from separate temperature controls, the double shower also has his and her sides. 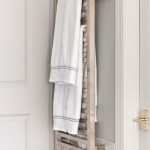 “My side has a handheld spray that we also use for cleaning, those days when because of surgery or some other reason you can’t be fully immersed in water, and for washing our dogs,” Chuck says, who notes that the shower also has a bench for ease of use. On Charlene’s side, you’ll find a wall of body spray jets installed for what she calls a “carwash-” like, quick yet relaxing effect. 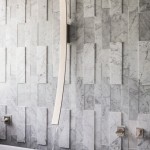 Aside from the bathing areas, a number of other functional features were incorporated in the design. 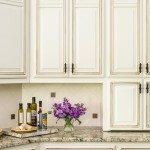 Quartz countertops were chosen over marble for their stain-resistant quality; LED-bordered mirrors offer cross lights for additional task lighting; pop-out outlets disguise electrical receptacles; and drawers (rather than shelving concealed by doors) with soft-close guides keep the space tidy. 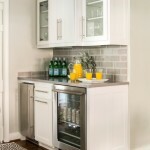 Concealed—but equally important—are a tankless water heater, which ensures that the dishwasher, washing machine, and shower can all perform at the same time without a water shortage, and heated floors, which the Prousnitzers keep at a constant temperature throughout the year for comfort and consistency. “Gary renovated this kitchen 30 years ago,” says Cathy Pursell, wife and business partner of Gary Pursell, of Gary Pursell Construction. 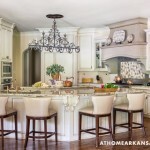 “So, basically he tore out his own work to remodel this kitchen for their family,” she laughs. 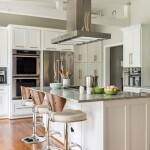 After three decades and a change in ownership, everyone agreed it was time to reinvent the space and create a kitchen with multiple zones, an abundance of amenities, and an inviting, fresh feel that suited the owners’ style and would welcome their now-grown children home for family gatherings. 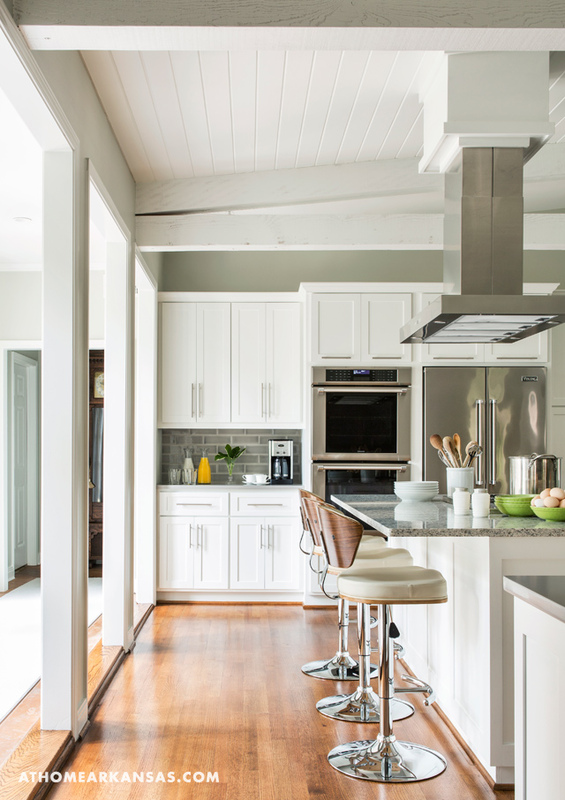 The homewoners had worked with the Pursells, who also operate Creative Heights Partners—the design arm of Gary Pursell Construction—on a large curb appeal makeover, so it felt natural to turn to them for the complete overhaul of the hub of their home: the kitchen. “After Gary did the front of the house, I felt like we had confidence in him to do the kitchen, and it was just the perfect time. He could picture it exactly as it looks now, even though I couldn’t,” says the homeowner, who has lived in the residence for 22 years. 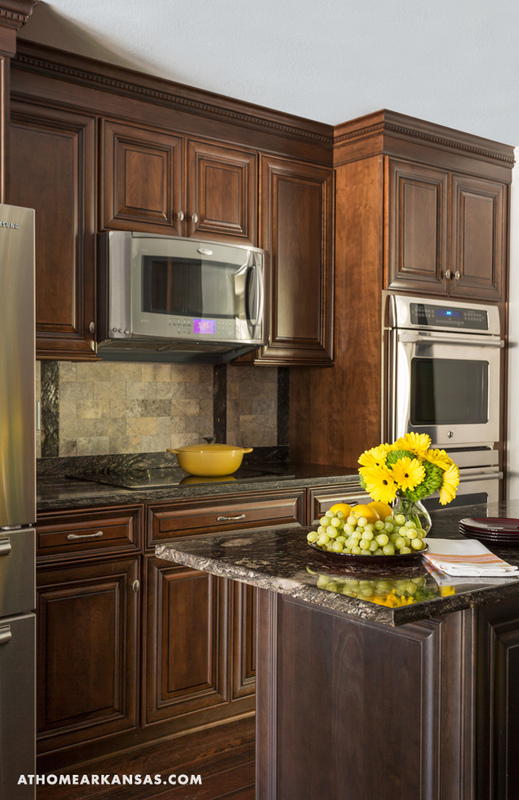 One of the biggest goals was to open up the kitchen to the rest of the home. The area was both cramped and separated from other rooms—meaning the chef had limited space and often missed out on conversations. To remedy the situation, the Pursells took in the home’s dining room, giving them additional square footage, and knocked out a wall that separated the common areas. 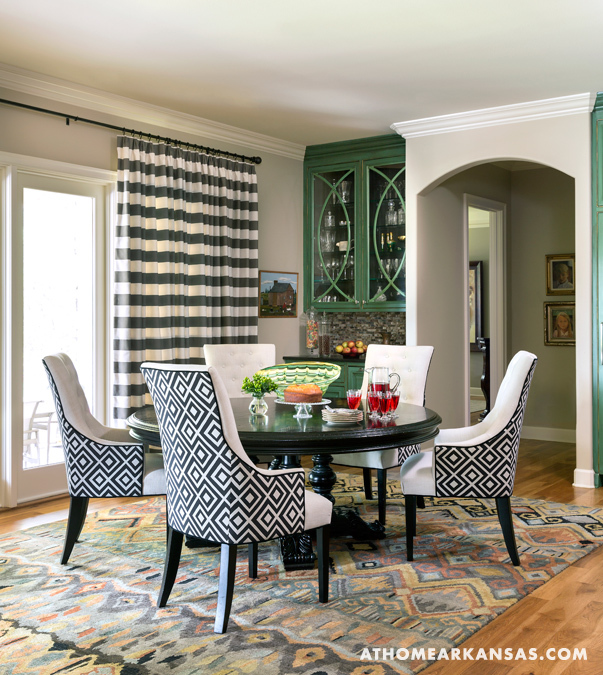 The dining room was relocated to a little-used formal living room. They also raised the roofline to give more space overhead. 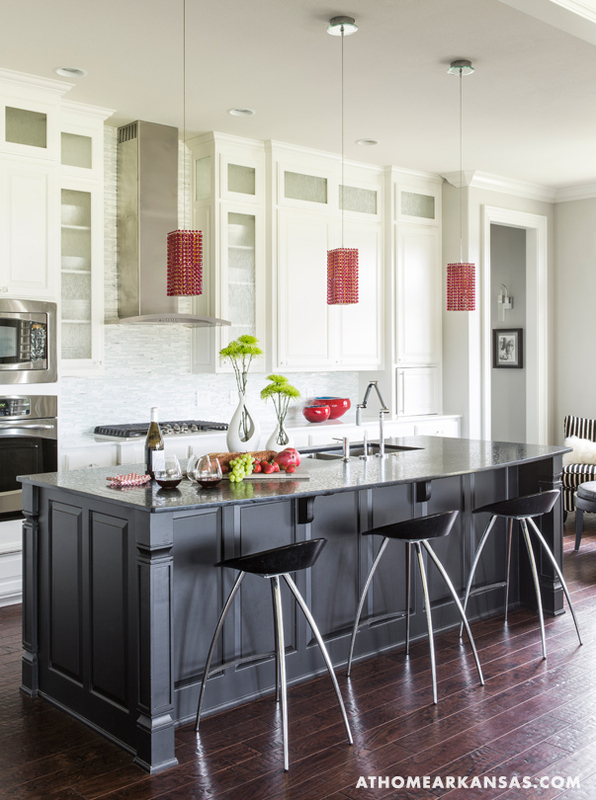 Now, separate zones—including the island and cooktop, the prep area, a coffee bar, a hospitality area, and a dining space—dot the room. 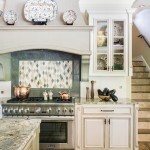 While the homeowner knew she wanted the kitchen to be more spacious, she wasn’t set on any one aesthetic. “She came to my house and said ‘I love it,’ ” says Cathy, who developed a friendship with the homeowner during the renovation. 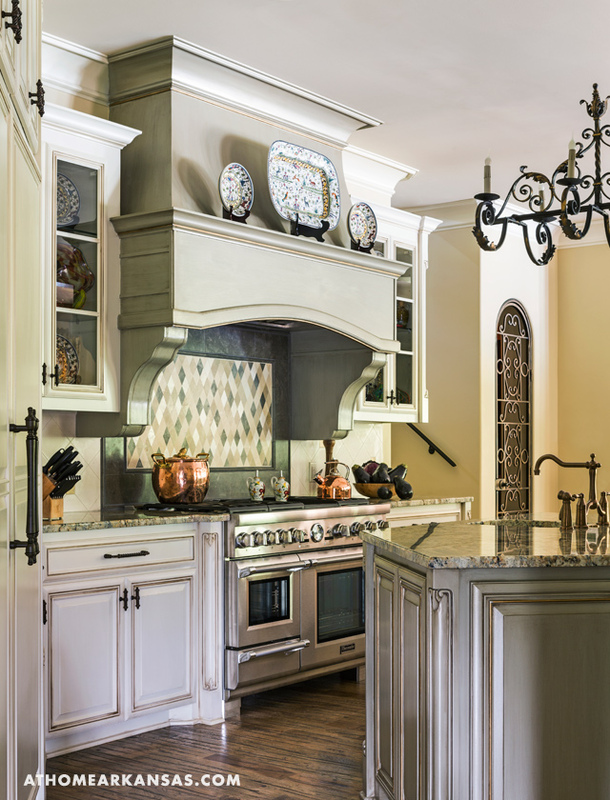 Drawing on design details the client liked from the Pursells’ own home, Cathy created a kitchen rooted in traditional style but accented with modern flourishes—a true transitional-style space. “She wanted it to be contemporary but not cold—really kind of a mix. 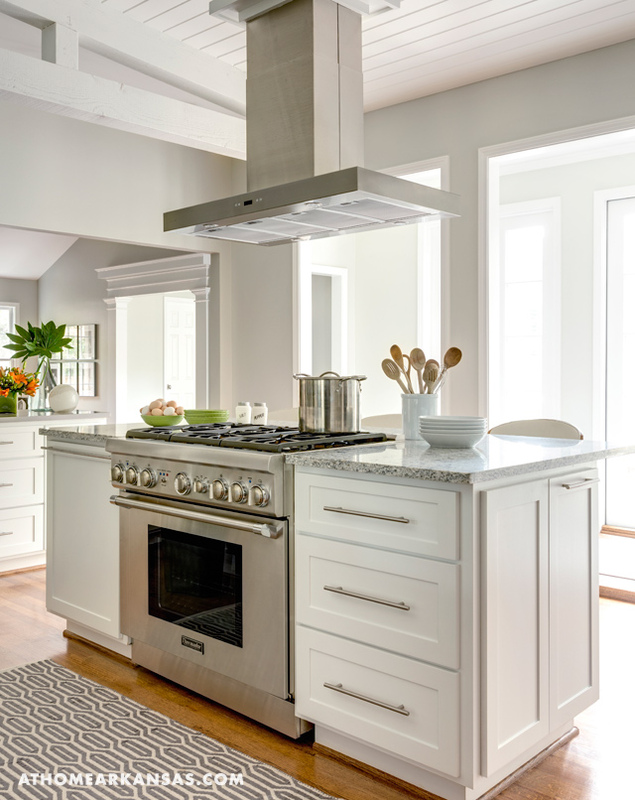 Originally, she was considering an all-white kitchen but I suggested the gray for a bit of balance,” Cathy says of the steely—yet warming—hue. 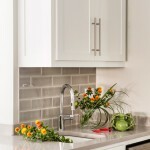 The gray, which appears in the backsplash, walls, and countertops, marries with the stainless steel appliances and fixtures for a well-coordinated and relaxed feel. The Pursells often work side by side: Gary from the contractor’s viewpoint and Cathy from a decorative perspective. 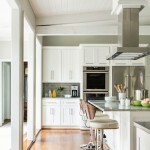 To make the home truly function for the family, they worked together to assess the way the homeowners live and use their kitchen. 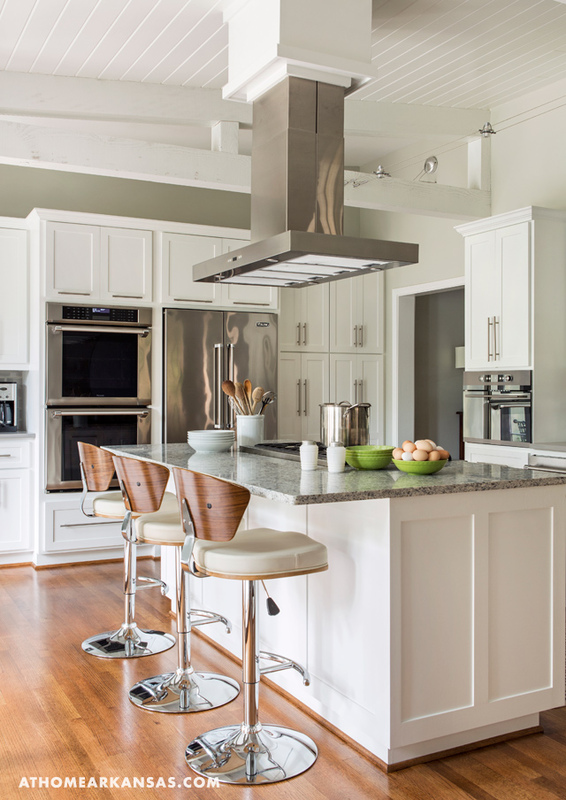 “We worked with [the homeowner] on all of her space needs down to where she wanted to keep her baking pans and recycling bins—we got very detailed on this project. 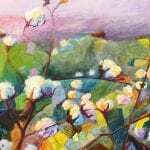 We mapped it all out and got it just where she wanted,” Cathy says. 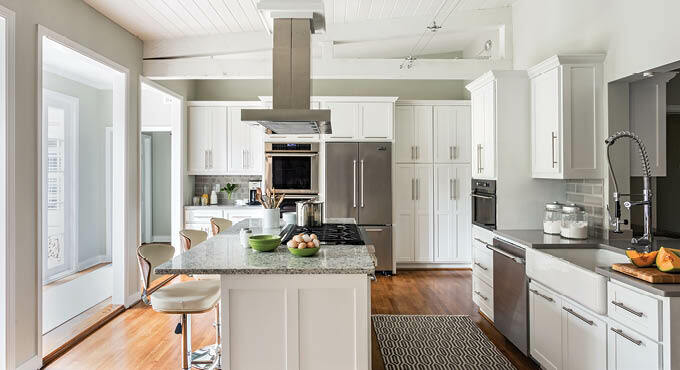 Aside from high-functioning elements including the tall, restaurant-style faucet and large apron sink, the homeowners also gained storage in the island and the upper cabinetry. 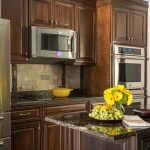 In addition, a second dishwasher—located in the hospitality area—makes for easy cleanup after family gatherings or parties. 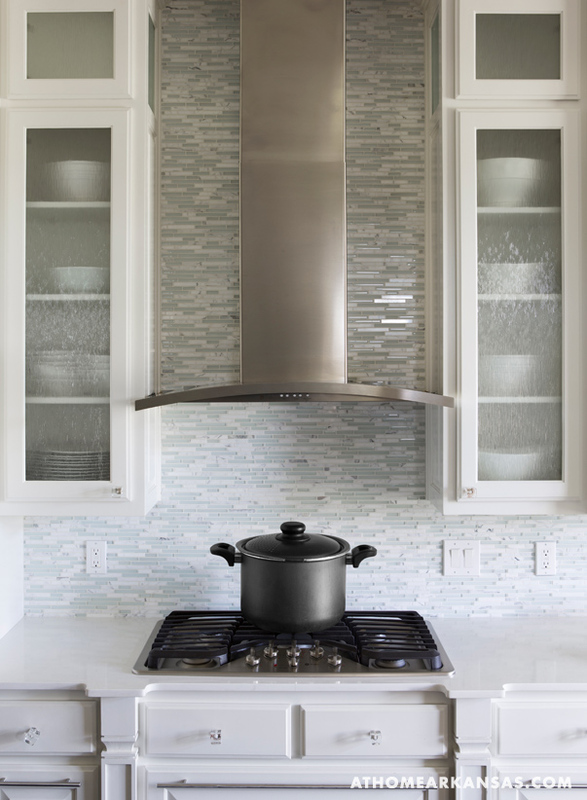 “We have so much fun coming over here to cook now; we even broke in the new kitchen by making a big pot of gumbo,” says Cathy of the end result. First, Towery and the Casalis selected Top Star granite for the countertops; this choice guided them to the color palette for the room. 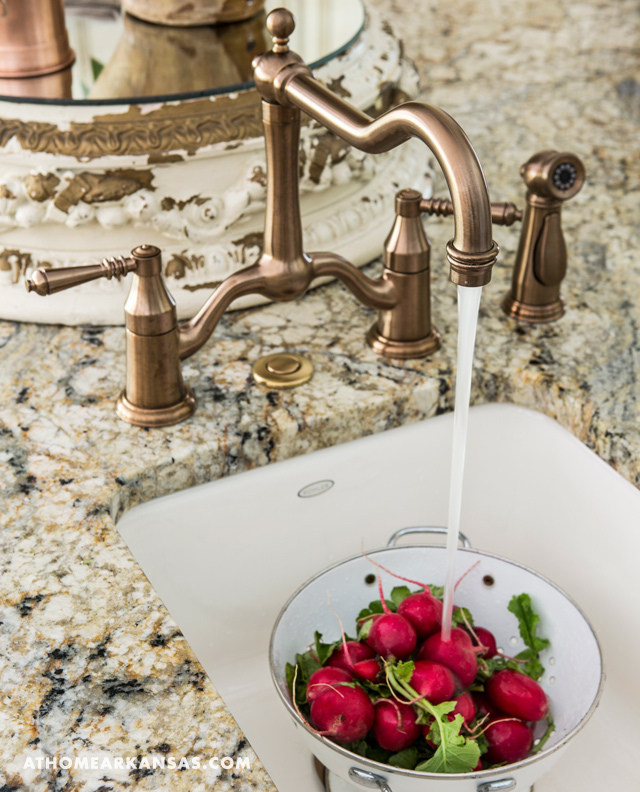 The stone surface is rich and dynamic, with mottling in a palette of contrasting neutrals shot through with an array of warm metallic tones. 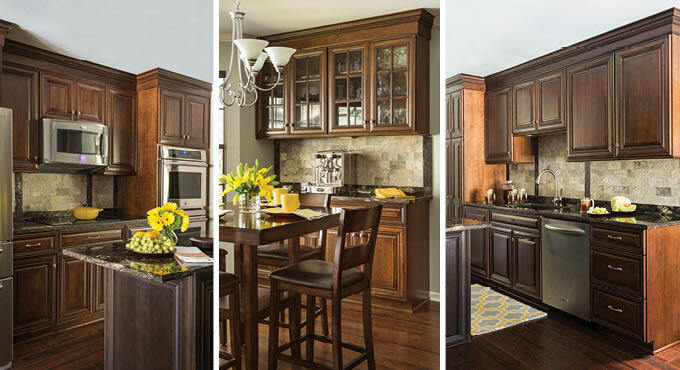 “When we got the granite in and set out to choose the accent color for the island and vent hood, we must have bought twenty samples to test to find the perfect color,” Towery recalls. 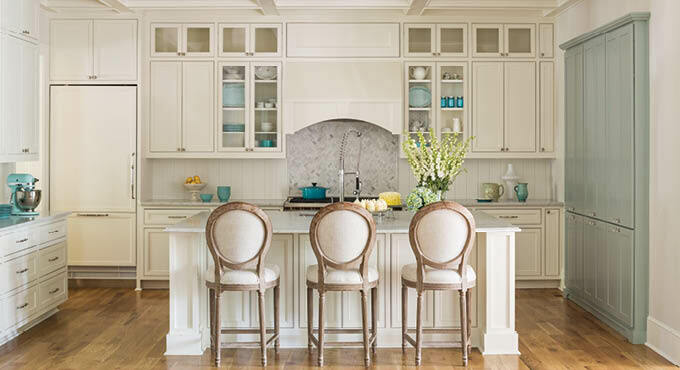 She finally chose a muted, pale celadon that pairs gracefully with the white seen on the rest of the custom cabinetry in the space. 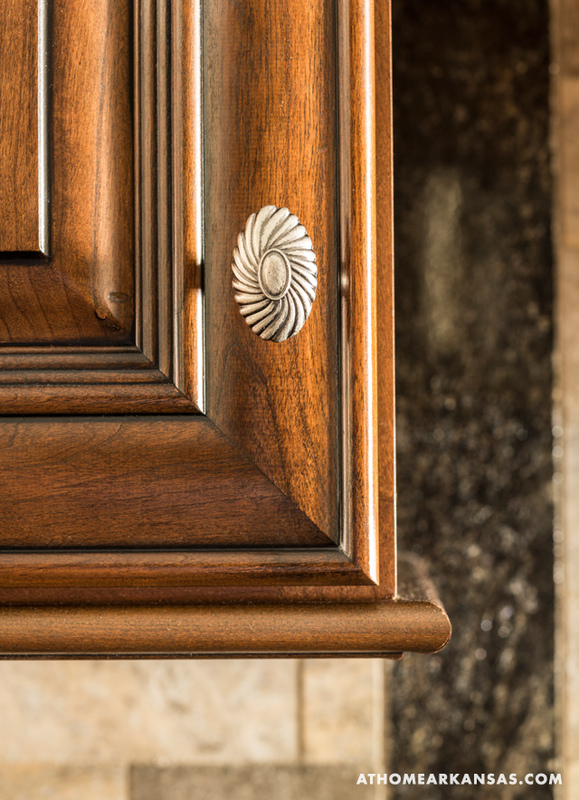 To take the kitchen’s air of elegance to the next level, Towery brought Tracy Rivers of Angelfish Studios on board to soften the finish of the cabinetry with a metallic sheen. 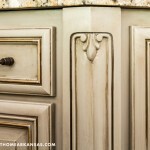 “I don’t usually choose to do faux finishes in my projects;” Towery notes, “I like my finishes very quiet. 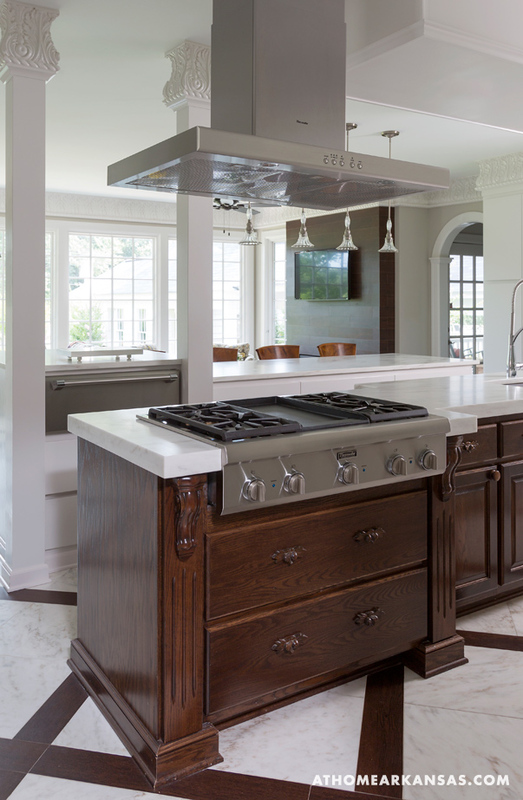 But I wanted to dress up the cabinetry in a subtle way.” Rivers applied a pearlescent wash to the white cabinetry and a bronze wash to the island base and the vent hood. 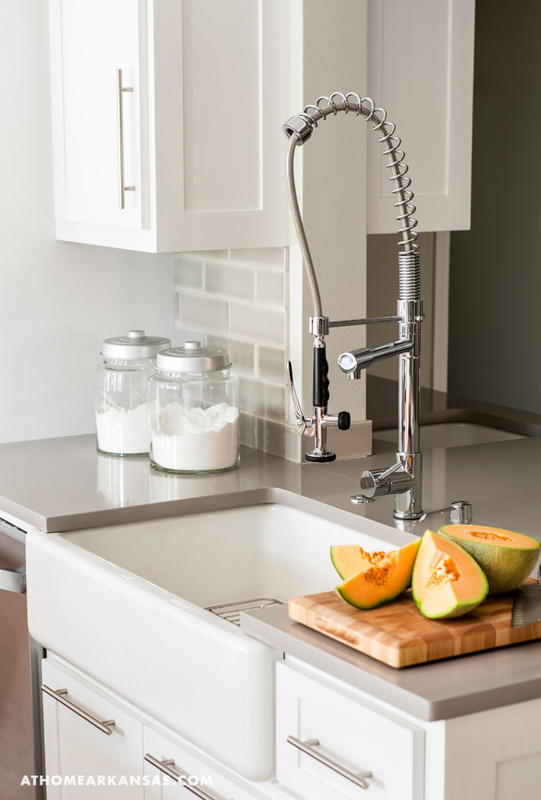 “It’s very unusual to have a metallic wash in a kitchen,” Rivers says, “and that’s what makes this very special. 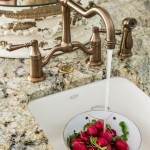 The result is just so soft—the luminescence makes it very delicate looking.” Rivers also painted accent striping on the hood and island cabinetry to simulate brass embellishment, complete with faux solder lines for authenticity. 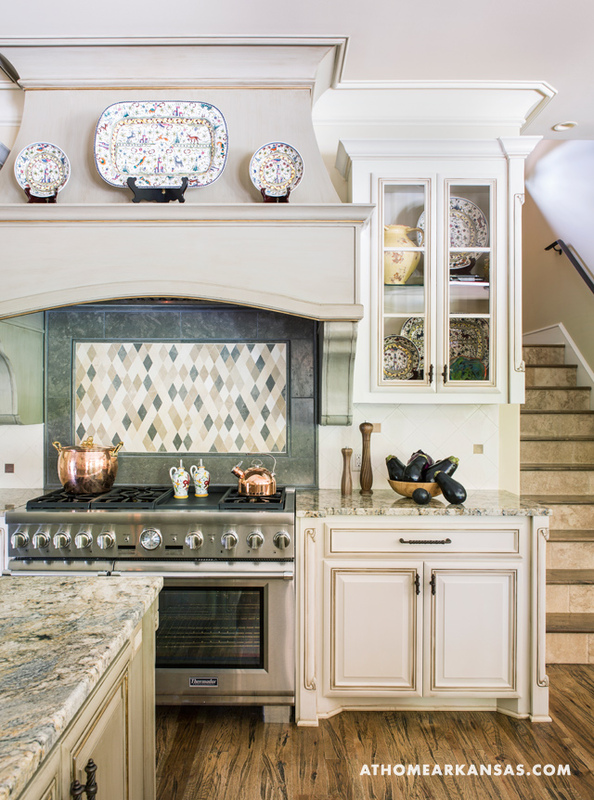 In just three years, Cricket and Bob Butler undertook two kitchen renovations. “We were in another home—where we thought we would be forever—and decided to remodel that kitchen,” Cricket explains. Little more than a year later, the couple found themselves in a new neighborhood with another kitchen in need of an update. 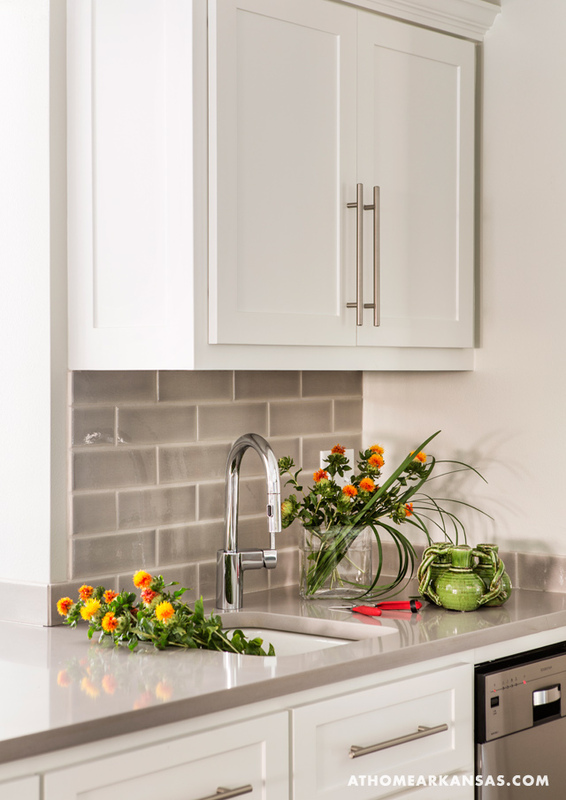 “I called Susan [Johnson of Kitchen Tune-Up] again, because I loved the finished product from our old home and working with them.” Together they took the kitchen down to its studs to create a space the couple will love for years to come. 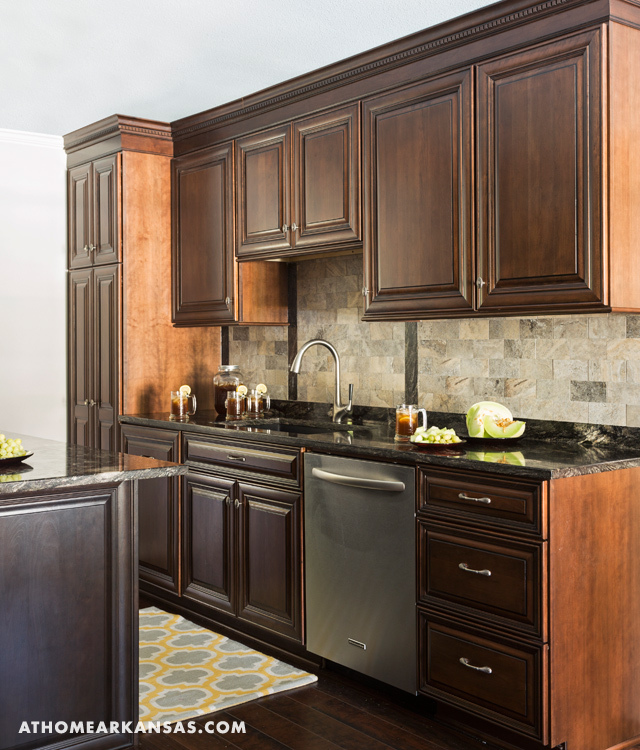 Dark, cherrywood cabinetry pairs with granite countertops and a natural travertine backsplash—which is bordered with the same granite found on the countertops—for a traditional appeal. 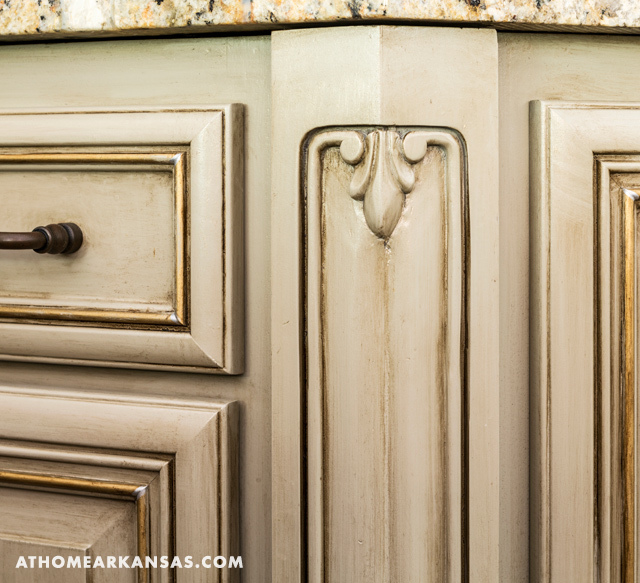 Details, including dentil molding and weathered nickel cabinetry hardware add character. 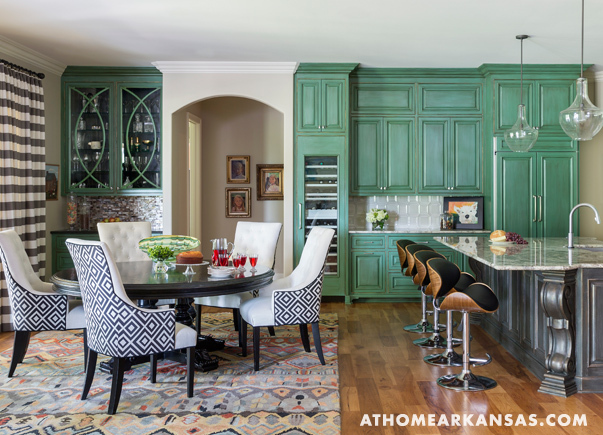 “One of the things I love about this kitchen is that it’s not so big or outlandish—its design is fully attainable in any space. 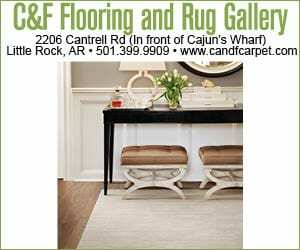 It really lacks for nothing; it has all of the elements and beauty of any larger space,” Johnson says. Baking and decorating cakes is one of Cricket’s favorite pastimes, so a central island was a must-have to provide her with ample workspace. 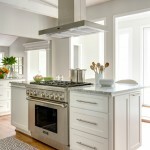 Additionally, she requested a double oven—a feature she did not have in her previous kitchen—to accommodate multiple dishes. 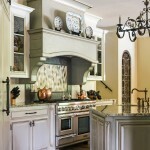 The cabinetry extends to the ceiling and provides plenty of storage for all of her baking supplies and cookware. 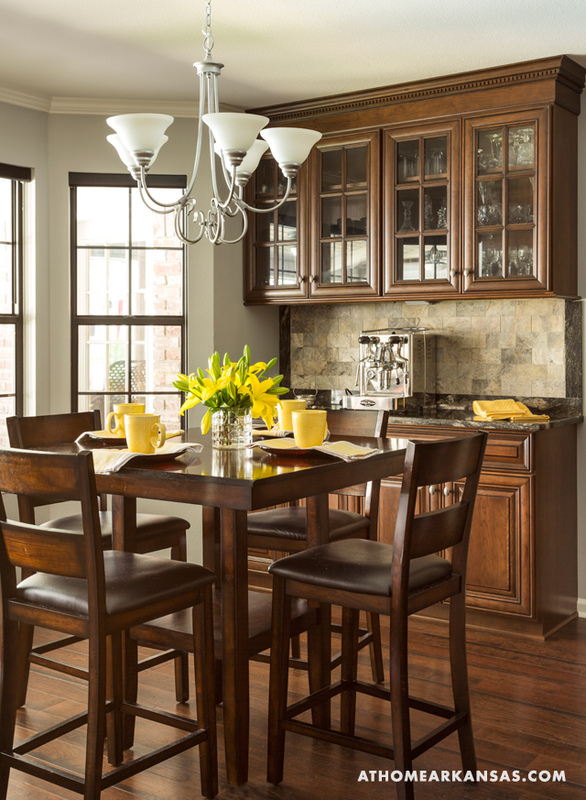 While the kitchen remains cozy when it comes to square footage, the layout allows for a dining space at the far end. 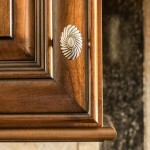 Here, Johnson also designed a cabinetry piece with glass-front doors to give the couple a place to display crystal. 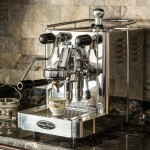 The Butlers love coffee and wanted a nook for their Andreja Premium espresso machine. 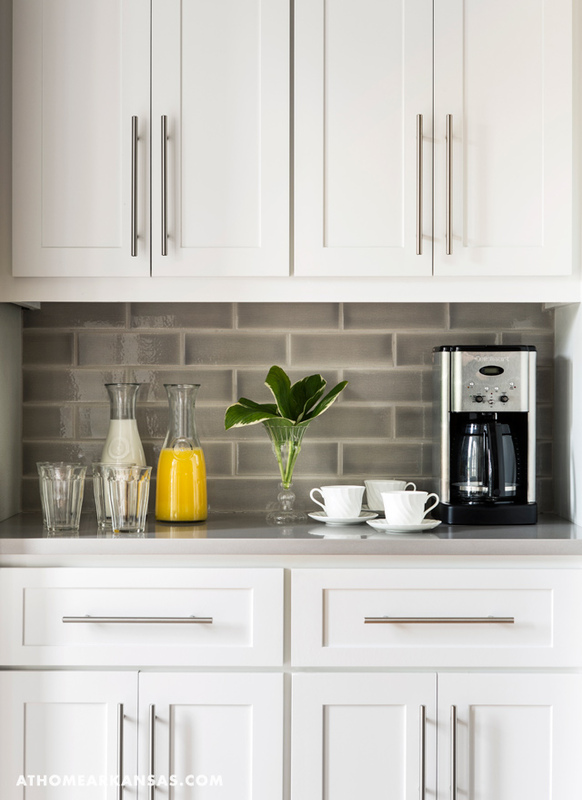 The counter space on this built-in unit is a perfect spot for it—allowing them to easily refill their cups while they eat breakfast or read the morning paper at the dining table. 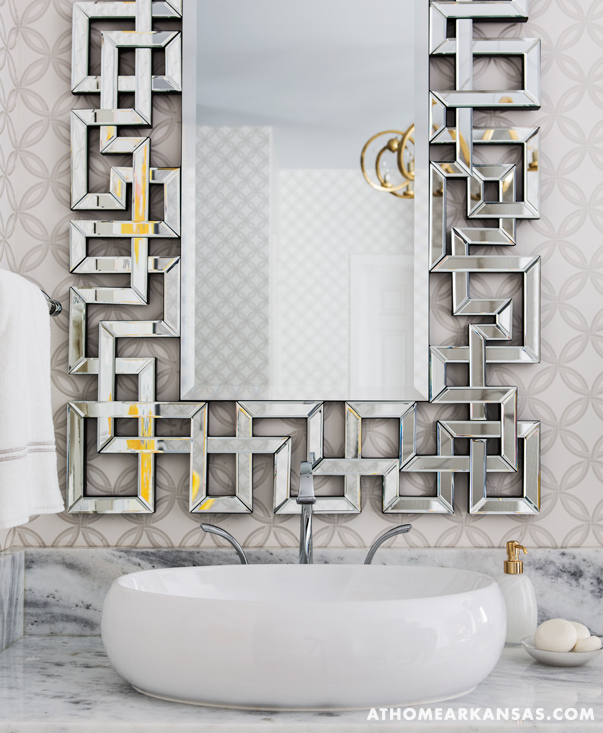 Familiar with Bridges’ “classic, but with a twist” personal style, Goddard was inspired by interpretations of classic motifs to create a chic, sleek space that is a study in transitional style. “I repeated several variations of three shapes—a circle, a twist, and a graphic line—to give the space layers and keep the eye moving,” Goddard explains. 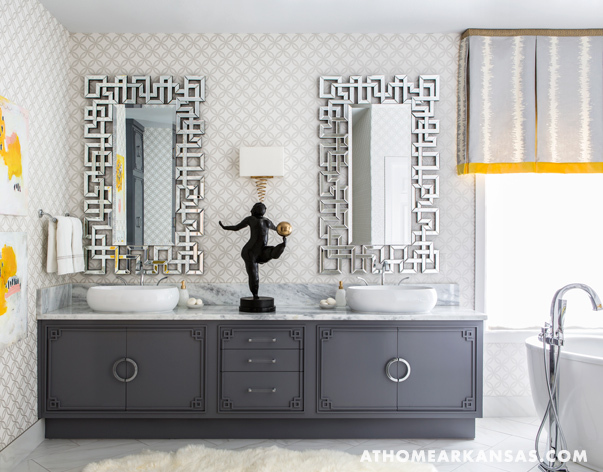 His interpretation of the Greek Key motif combined with Asian fretwork appears on the custom cabinetry and vanity mirrors, while the room’s Schumacher wallpaper features overlapping circles in soft shades of gray, white, and beige; the sconce and chandelier incorporate the twist shape. 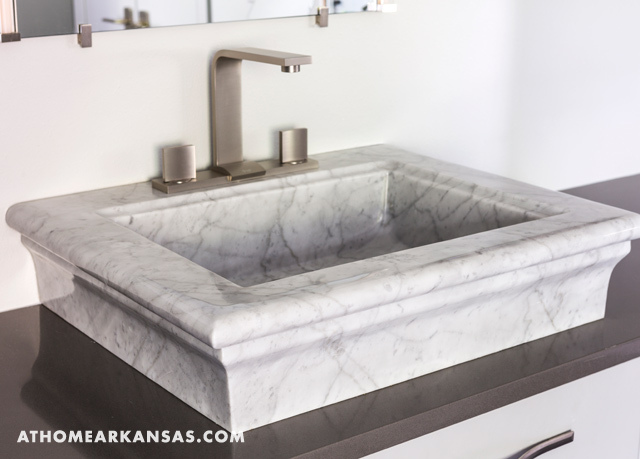 The heavily grained Brazilian Carrara marble on the vanity sets the space’s palette of soft gray and white, which is punched up by the charcoal gray cabinetry. 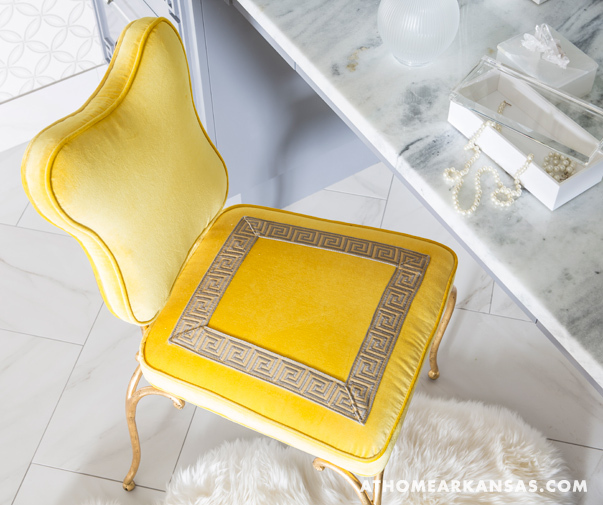 Bridges made only one request for color throughout the house: yellow, her favorite hue. Goddard used a sunny shade of the color in small but high-impact doses throughout the room. When it comes to keeping a home, more is not always more. Such was the case for Diann Hurley, who recently downsized to a new home on a golf course in Northwest Arkansas. “I have about half of the square footage that I did in my last home, but am finding that I could actually live with even less,” she says. Hurley worked with builder Clint Williams of CW Homes, Inc. of Fayetteville. “Clint is very meticulous and hands-on, so I knew the house was in good hands,” she says. 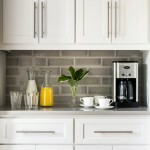 “My previous home was more traditional, and this time I wanted a very clean, crisp look without a lot of fuss,” says Hurley of the predominantly black-and-white space. 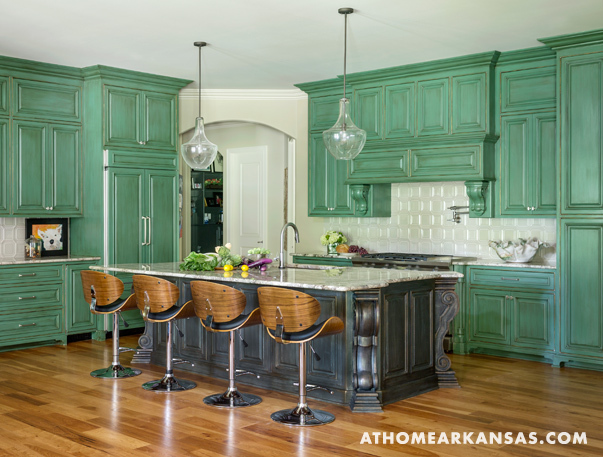 Dark hardwood floors with a distressed finish offer a touch of patina and, in contrast with the light walls and white cabinets, give the space the crisp feeling Hurley desired. 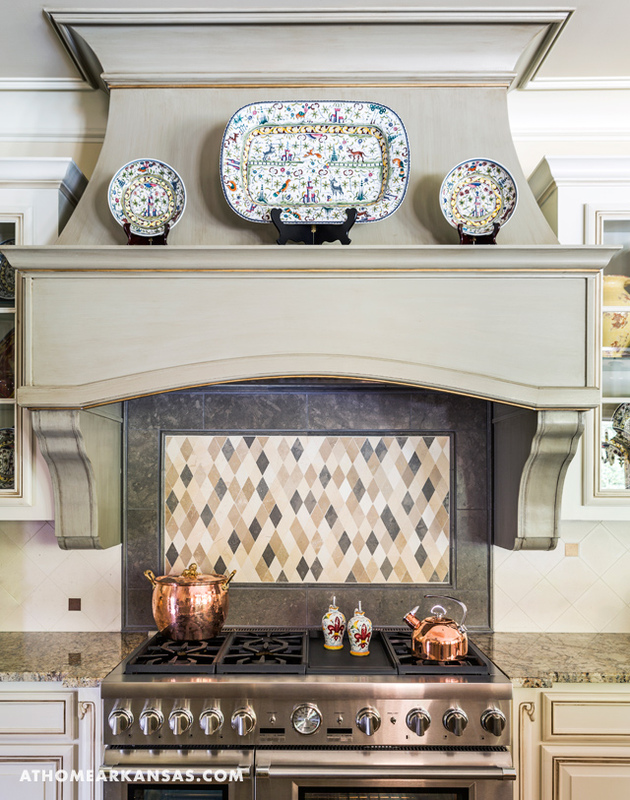 Having built her previous house, Hurley had experienced the design process before and had ideas about what she wanted for the home—especially the kitchen. 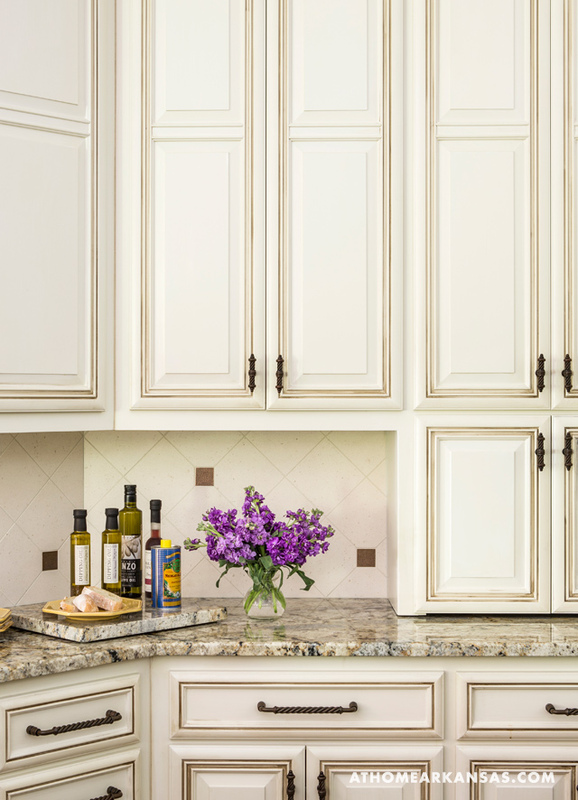 “I knew that I wanted floor-to-ceiling cabinets, smart storage, and easy-to-keep finishes,” she says. 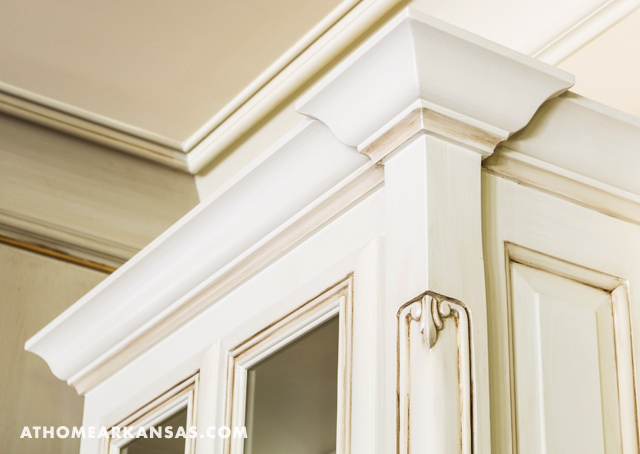 Custom cabinets from TL Wood Products stretch to the crown molding to make good use of every inch of space and eliminate the need to clean cabinetry tops. 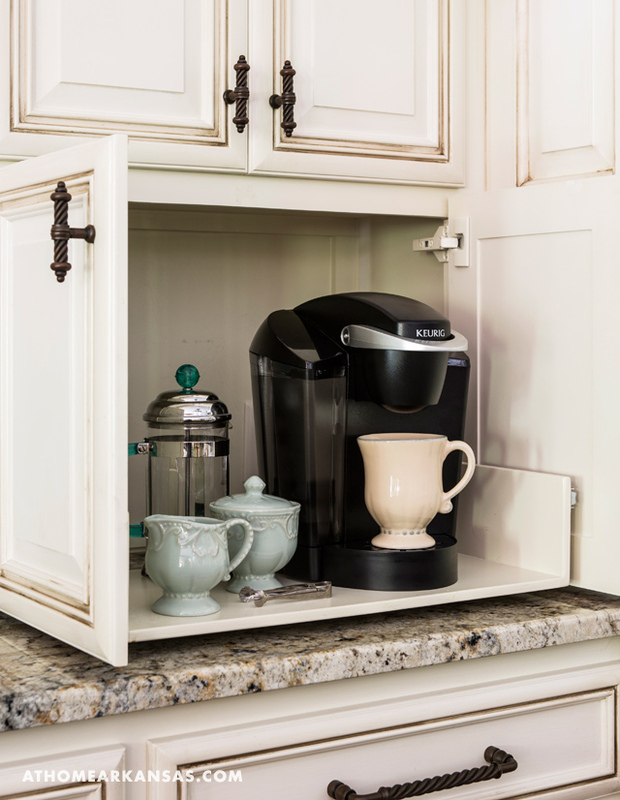 A large walk-in pantry more than suits her storage needs, while a small appliance garage keeps the counters free of clutter. 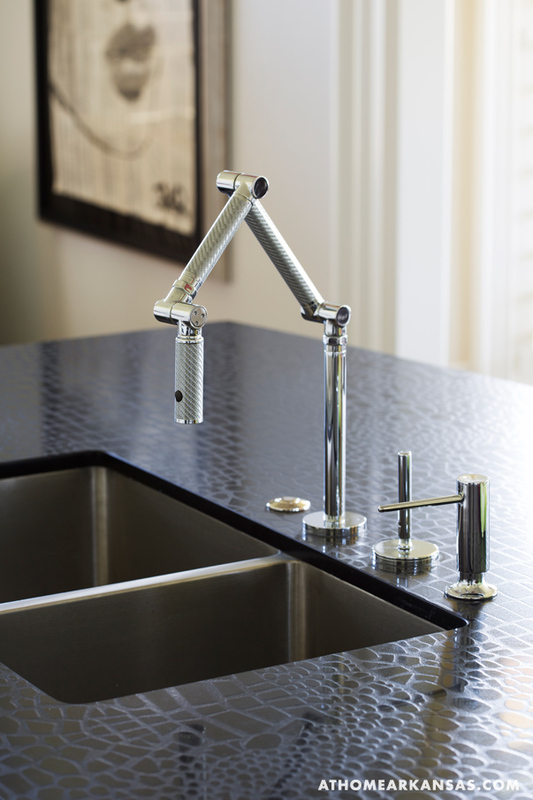 On the large island, the stainless steel under-mounted, double-basin sink allows for easy maintenance and a smooth, clean look, while an articulating Kohler faucet feels both modern and industrial. The island faces the den, where Hurley frequently entertains friends. “I love the open concept. It’s nice to not be isolated while in the kitchen,” she says. 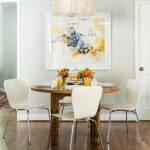 Barstools at the island and a nearby dining room negated the need for a breakfast table, so instead Hurley furnished the area with a pair of comfortable slipper chairs that invite conversation as well as reflection. “The window looks out onto the golf course, but it feels very pastoral and relaxing,” Hurley says. 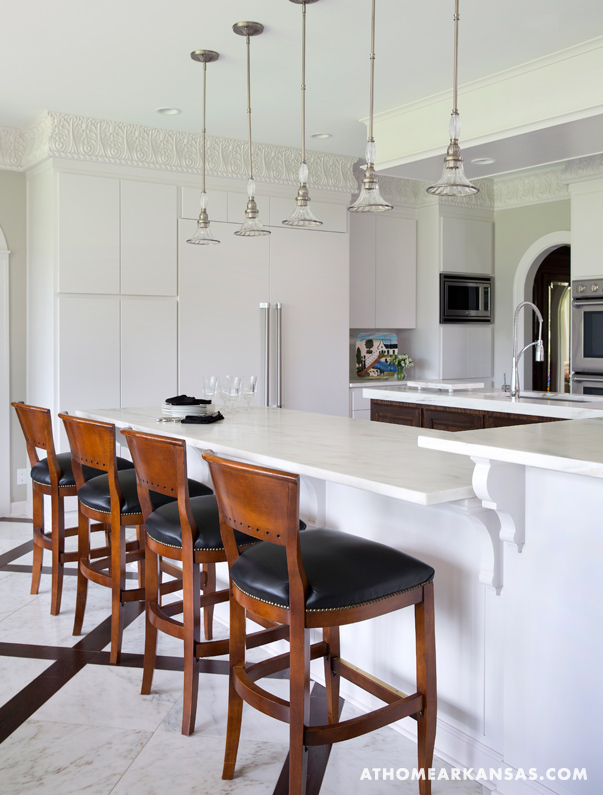 When it came to the room’s expanse of countertops, durability was an important factor. 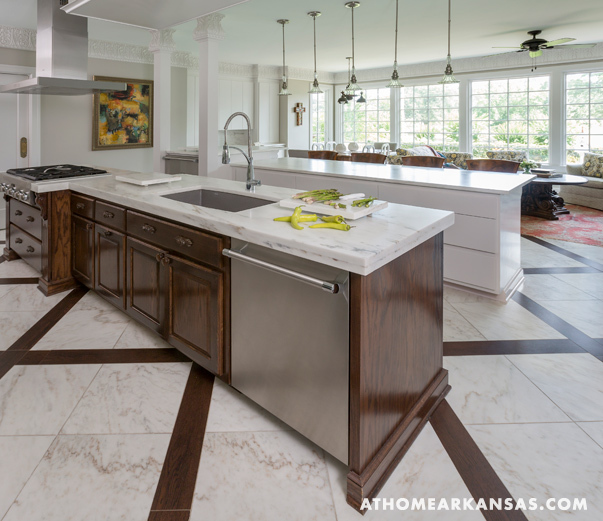 “Diann knew that she wanted quartz because it is heat-, scratch-, and stain-resistant,” says Holly Chesnut of Springdale’s New Century Counter Tops and Tile. 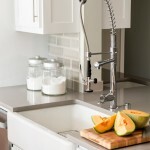 “We introduced her to a Caesarstone product that is embossed with a crocodile print.” Hurley’s previous kitchen had polished granite counters, and while she appreciated the ease of use, she found keeping them fingerprint-free to be a chore. 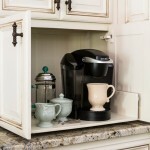 “With the textured quartz, I got the dark look that I wanted without the upkeep,” she explains. For Hurley, the time spent poring over every detail of the kitchen was worth it. 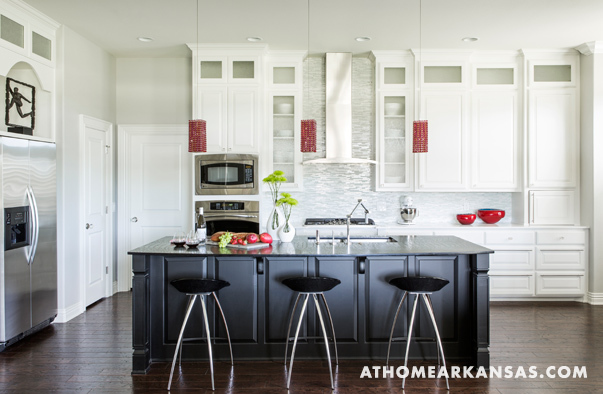 “With the help of the wonderful team, the kitchen came out just as I’d hoped—sleek and open, with a relaxed transitional style,” she says. For Randy and Lydia James building houses is a way of life. 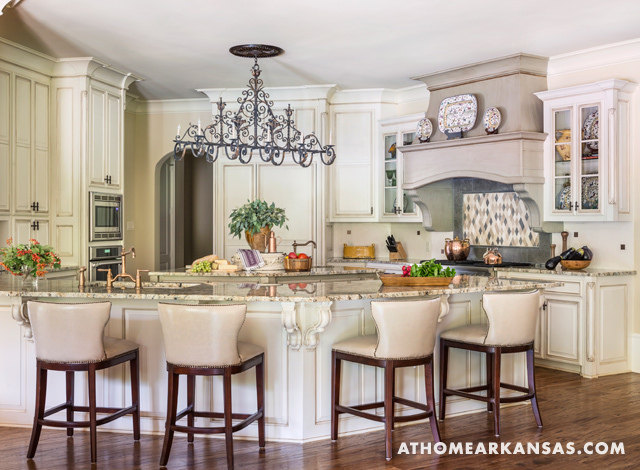 For more than 26 years, the couple has been working together to craft homes for Arkansans, so when it came to creating their own dream residence they had a few ideas in mind. 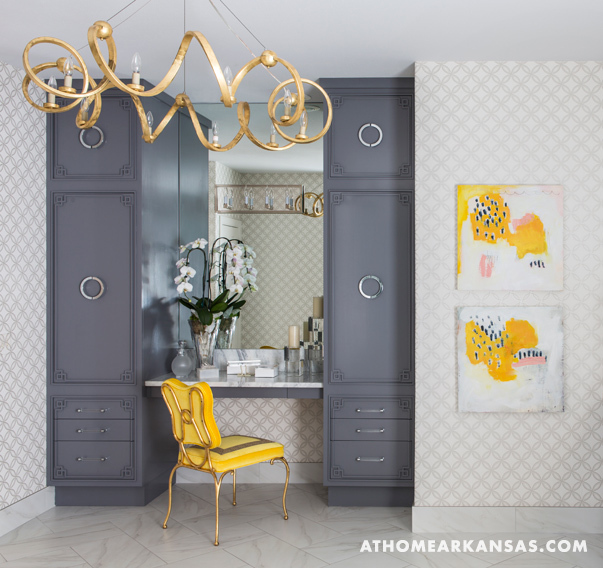 “Because we’ve built so many homes we knew what we didn’t want—and we didn’t want it to be too formal,” says Lydia of her Little Rock home’s overarching design. From the start, the Jameses decided to consult with Miguel Newberg of M. N’Teriors, with whom they had worked on several other projects. Not only were they fond of working with Newberg, they knew she could help them with the design process. “Everything was a challenge for me,” Lydia says. “I do it for others all the time [in spec homes], but I struggled with my own home,” she admits. 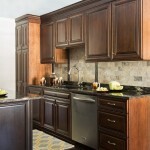 One major choice that seemed to stand out from the start was the color for the kitchen cabinetry. 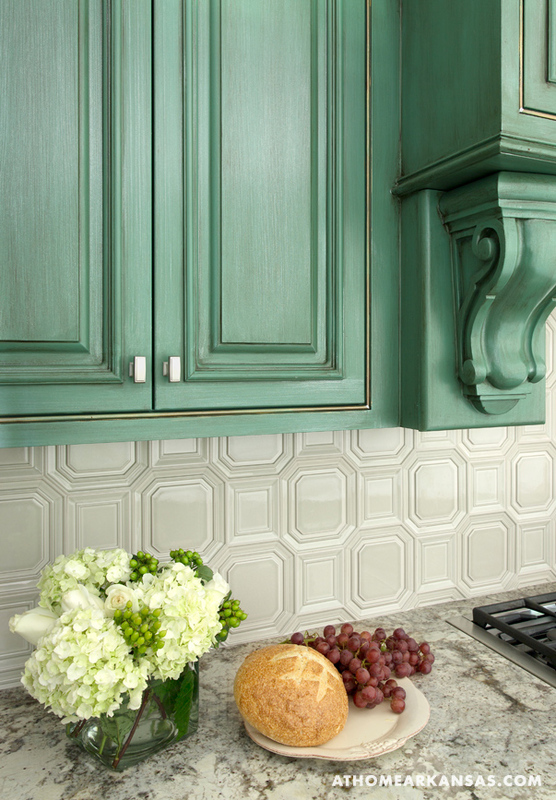 “Green has always been a favorite of mine, and the cabinet color was actually the first thing I picked out,” Lydia says. 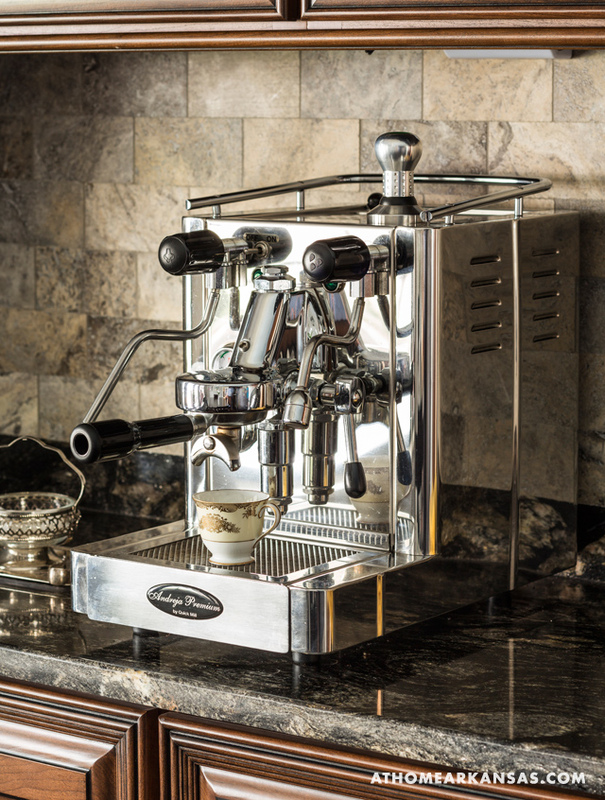 The alluring emerald has a modern feel that is still very much grounded in traditional design. 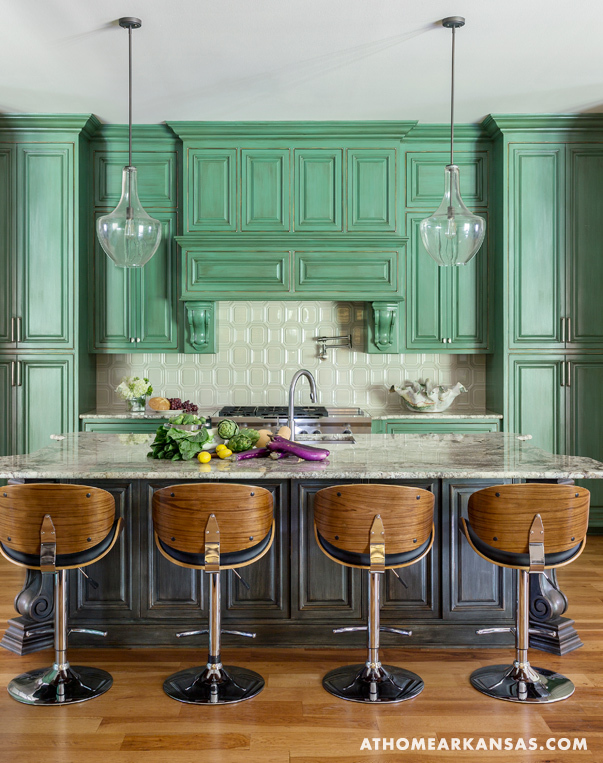 The color was inspired by the cabinetry in Cameron Diaz’s Manhattan apartment, which was designed by Kelly Wearstler. 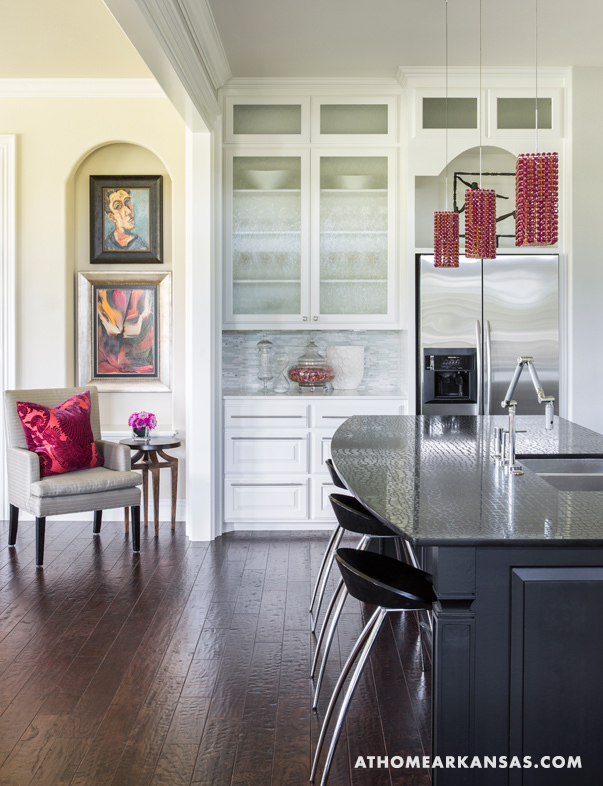 After seeing Diaz’s kitchen in Elle Décor, Lydia fell hard for the bold, statement-making color and knew she wanted to use it in her own home. “Through the process, I actually started waffling on the color, and I may have changed my mind if Miguel hadn’t convinced me it was perfect,” Lydia says. 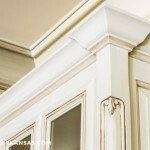 Luckily, she stayed the course, and it is now one of the room’s most-loved features. Eye-catching wasn’t the only requirement on the James’ wish list. The newly built kitchen also had to be functional for their family, which includes a son who is now away at college and two teen daughters. “Lydia and Randy are both great cooks, so it was important the space had easy-to-use elements,” Newberg says. 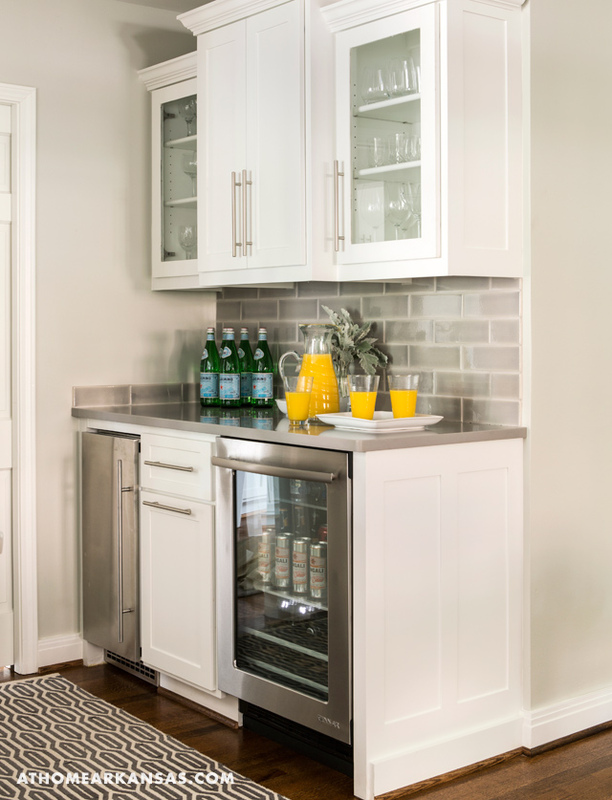 Features such as a touch-release faucet, dish-washing and refrigeration drawers—rather than traditional models—and a drink refrigerator designated for kids are all smart features for a family on the go. In addition, a walk-in pantry, built-in recycle bins, and an open-faced wine rack help to keep everything close at hand for the chefs. “The entire space is super functional,” Lydia says. The couple opted for a large, smooth-surfaced island with retro-inspired barstools and a separate breakfast table. 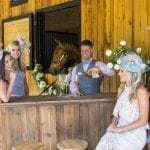 The bar is big enough to accommodate the entire family and also works well for serving appetizers and beverages when the couple entertains. These two areas offer the Jameses what Newberg refers to as a “casual, welcoming, and family-oriented” space. 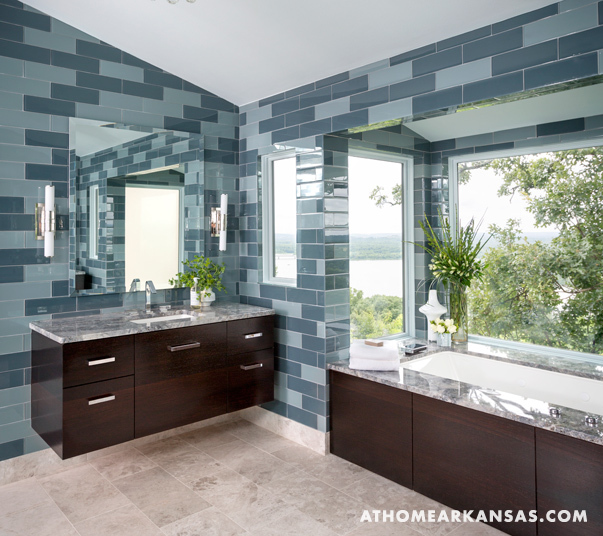 Scott Paterek and Tammie Weaver of Massimo Interior Design worked in close collaboration with the owners of a riverfront Little Rock home to renovate their master bathroom and transform what was formerly a cramped and confining space into an everyday spa experience. 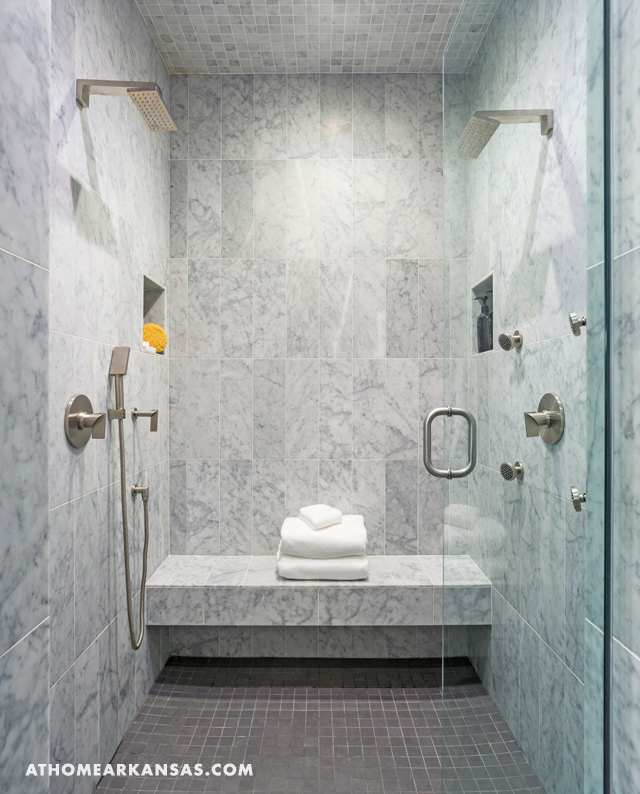 From the custom LED down lighting—which allows the couple to transition seamlessly from evening to night—to the oversized rainfall showerhead, every detail of the space is intended to delight the senses. 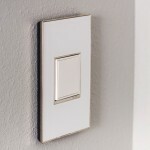 The result is a retreat—elegant but not extravagant—that invites self-care and produces an atmosphere of total calm. 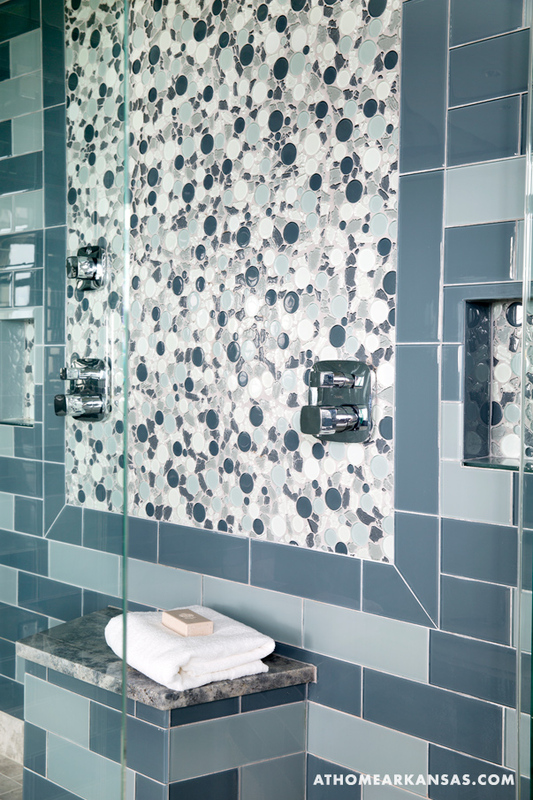 Floor-to-ceiling glass tiles wrap the room in two tones of grayish blue, creating a soothing, watery effect. 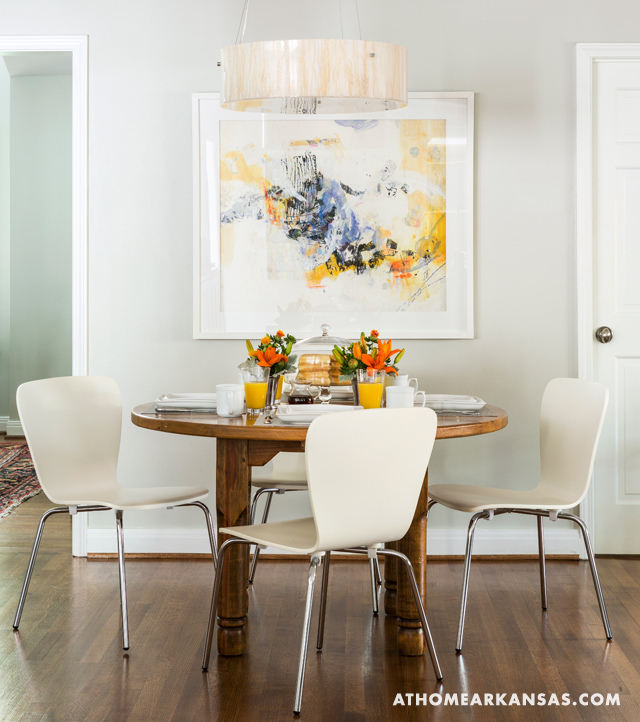 When the homeowners approached Paterek with the idea of using blue hues—in a home otherwise decorated almost exclusively in neutrals—he knew that the palette he chose would need to carry a lot of gray, in order to avoid a jarring transition into the space. “The rest of the house is very subtle, and if the walls had been a vibrant aqua, it would have been overwhelming,” Paterek says. 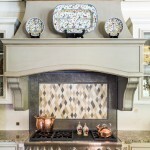 While colorful rooms can sometimes be trendy, he explains, configuring the two colors of blue tiles in a random, brick-laid pattern protects the room from ever looking dated, because it is an approach to design that is grounded in timeless principles. 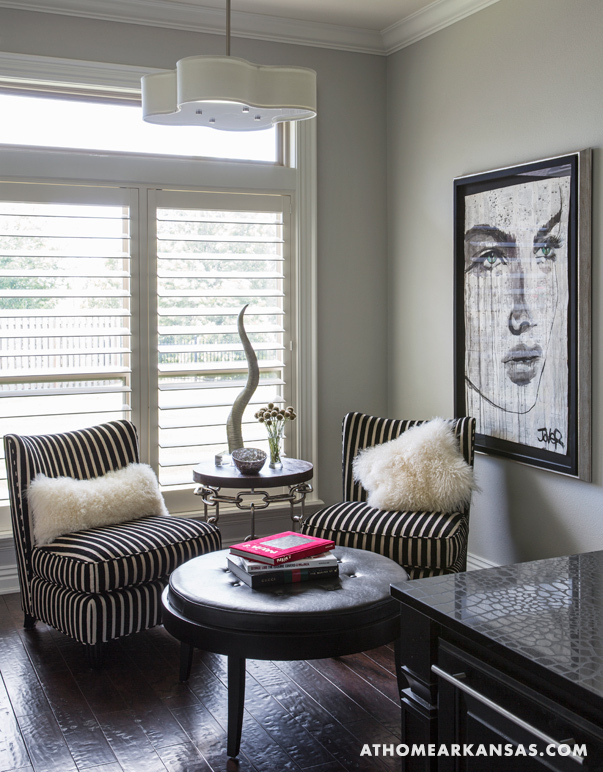 The greatest challenge of the renovation was the structural limitation of the room’s 13-foot width. As a solution, the team situated the bathtub in a deep bay, with picture windows on three sides. 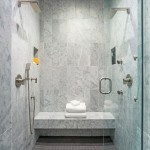 Extended closets and space for the toilet were added behind the shower, which allowed for an entirely open and symmetrical room design. 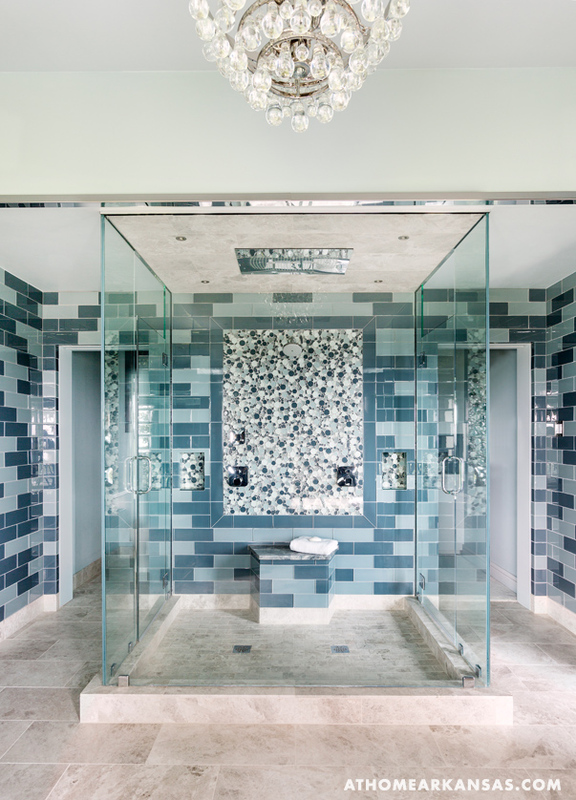 An oversized shower with transparent glass walls stands centered in the space, allowing for an unobstructed view of the river from every angle. Identical floating Wenge wood vanities are situated opposite one another, and the mirror hanging above each reflects the river, further enhancing the expansive feeling of the space. The symmetry of the room and its sleek, contemporary design inheres in the precision and angularity of the various decorative elements. 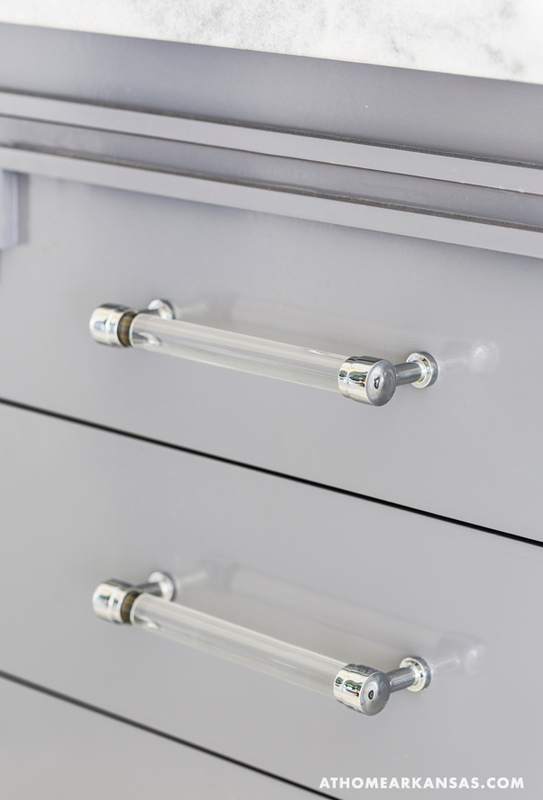 The metal finishes of the space are all polished chrome, and the hardware is linear. 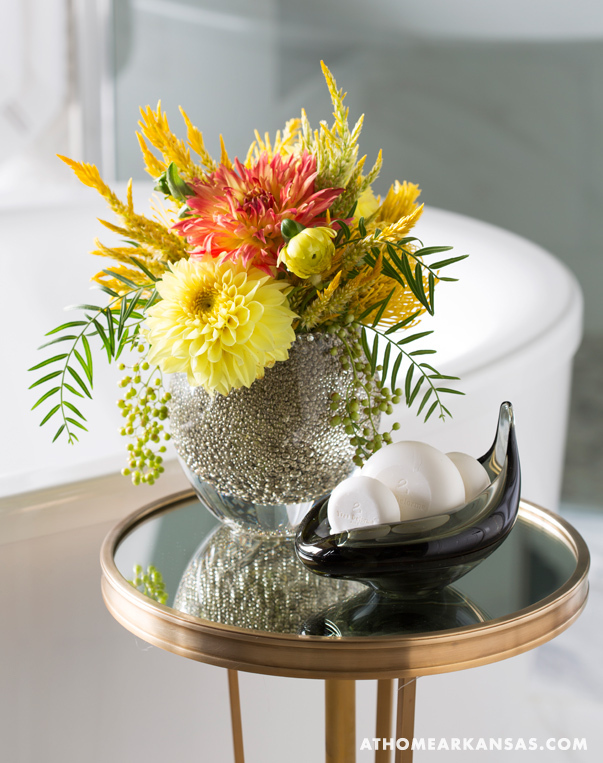 To soften the edge of the design, Paterek incorporated a circle motif that seems to allude to bubbles or pebbles. 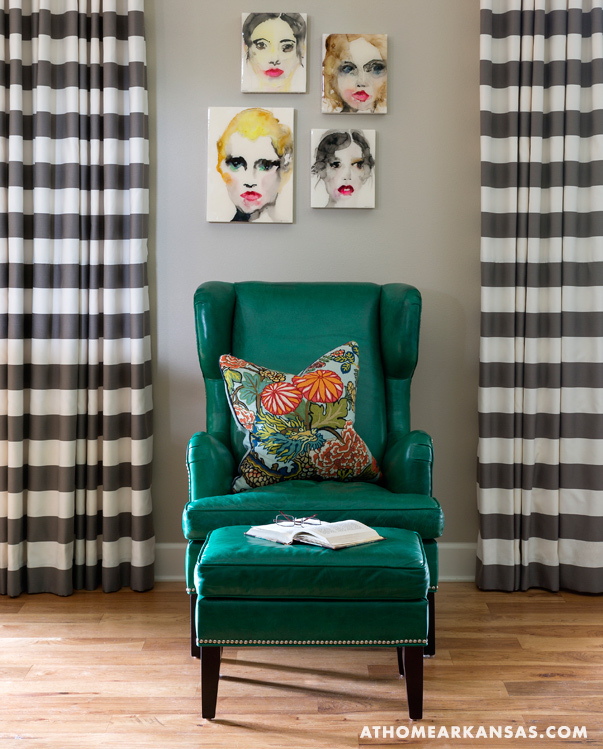 “The room is very tailored, and I wanted to add a little touch of femininity,” he says. 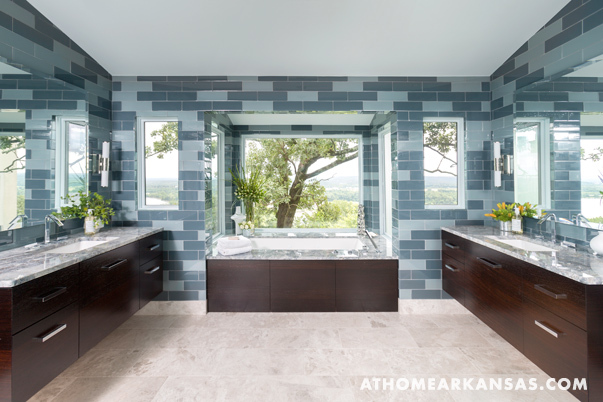 On the wall behind the shower, a framed section of circular accent tiles provides a focal point opposite the grand view and helps to achieve the balance Paterek was seeking. 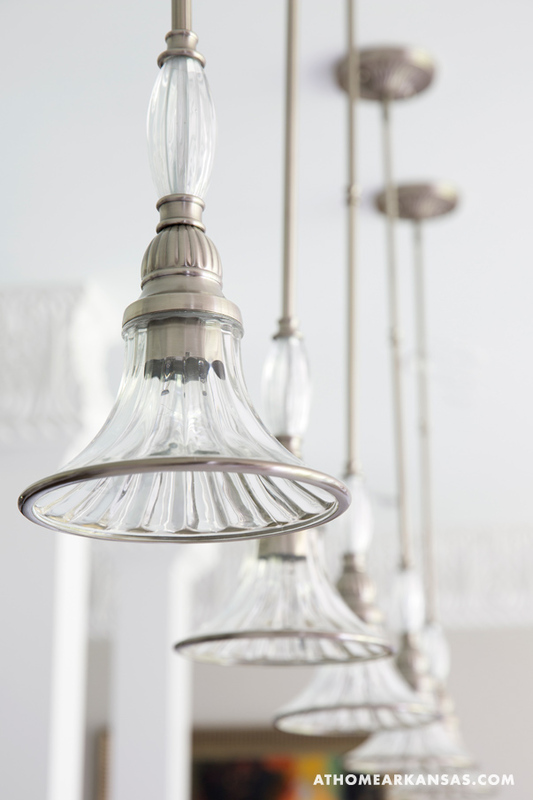 A Robert Abbey chandelier decked with glass droplets adds another more delicate, glamorous touch; “Its elegance and curvature make it like art, hanging in the middle of the room,” Paterek says.